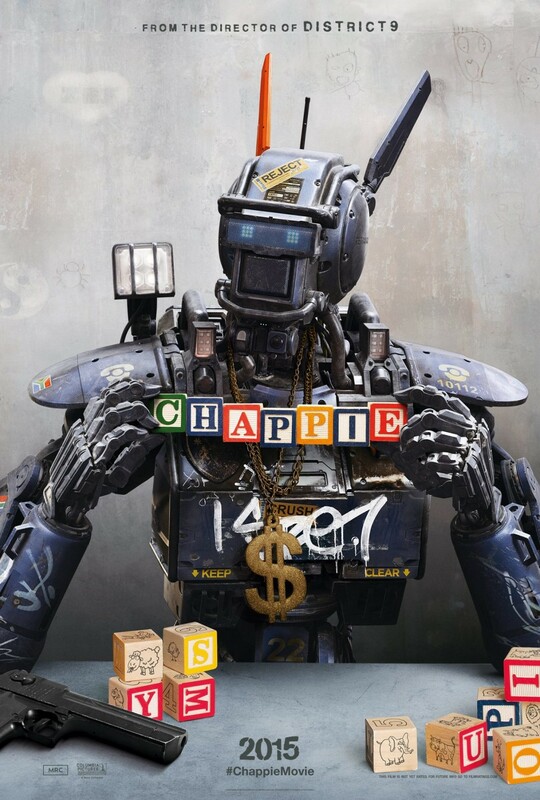 There are definite positives however, and personally I found the (surprising) humour fun and Chappie, as played by Sharlto Copley, fittingly and convincingly developed and flawless as a CGI design and execution. As expected, all the FX is state of the art including an ED-209 type killing machine on steroids (called “MOOSE”), as piloted by church-going, psycho engineer Vincent Moore – Hugh Jackman in an utter cartoon villain role. Dev Patel is the pick of the bunch as Deon, Chappie’s “maker”, but Sigourney Weaver does very little – similar to, but even less than Jodie Foster’s role in Blomkamp’s previous Elysium, as Patel and Jackman’s boss. The casting of South African Hip-Hop superstars, Die Antwoord in key roles, is more of a confusing conundrum. When a gang hijacks Patel’s Scout engineer and Chappie creator in order to use the robot to help them do a heist, we begin a middle section of the film where Yolandi and Ninja of said group do their best as nurturing “parents” to Chappie, who as we learn, needs to be raised and treated like a child while his newly installed consciousness is developed. Ninja is a an aggressive “gangster” who teaches Chappie to shoot and stab people, while also getting him half killed and Yolandi is “mommy” who reads him stories and tries to act as protector. Strangely and awkwardly, they seem to fit and are bearable – almost enjoyable, but at the same time, these are not professional actors and it shows. It didn’t derail the film for me, but for others, it might be too hard to get past some of their deliveries and the head scratching self-promotion from them throughout. They kind of play themselves but don’t, and operate on an odd forth wall level. Not to mention Ninja is a deplorable character. Though his films are often criticized (each new release seems to take on more than the last), Neil Blomkamp operates on a popcorn, blockbuster level, which sometimes makes me think most critics are either often contradictory or being unfair with their expectations. He doesn’t have Michael Bay level budgets but also, thankfully, not Bay’s apathy or failings as a director/producer or writer which too means he should probably get the benefit of the doubt as simply an action director who likes working in sci-fi. Blomkamp does need to work on his scripts there is no denying it and everyone pretty much doesn’t except for maybe the director himself. An excellent short filmmaker, he still shows he has trouble expanding to feature length despite filling the running time with impeccable imagination, sci-fi/robotic special effects and production design. We all know this is his forte after all and Chappie doesn’t really see Blomkamp turn a corner in any other way. Mainly it feels the whole doesn’t always equal the sum of it’s parts. Chappie doesn’t come off as fresh or intense as District 9, but fans should consider this a must see, as it is more of the same and Sharlto Copley’s transformation of Chappie is as good as (or better) than any motion capture performance that has come before it and worth the brisk two hour running time. This entry was posted in Film Reviews, Film: New/Cinema Releases and tagged 2015 Film, Artificial Intelligence, Chappie, Die Antwoord, District 9, Film Review, Neill Blomkamp, Robocop, Sc-Fi, Sharlto Copley, Short Circuit. Bookmark the permalink.